ON.OFF is a short two minute browser based horror game about turning a light switch on and off. 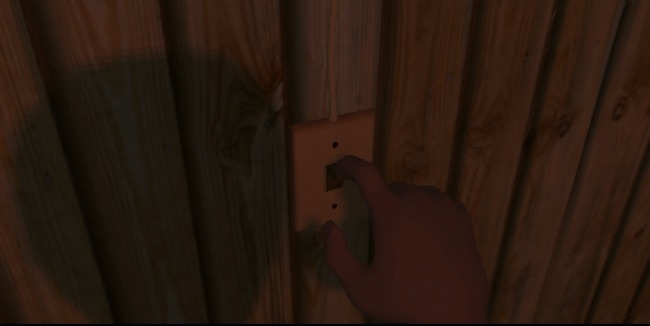 The entirety of ON.OFF is played with you facing a wall with a single light switch on it. You can click on the switch to turn it on and click on it again to turn it off. Occasionally you’ll hear a noise behind you or the noise of thunder in the background accompanied by a flash of lightning that illuminates the screen. It seems like maybe there’s someone or something inside the room with you, but all you can do is turn the light switch on and off, hoping that all you see is your shadow the next time the lights turn on! It only takes a couple of minutes to play through but turning a switch on and off in ON.OFF makes for a surprisingly tense and atmospheric horror experience. It’s by a different dev, but it would make a good companion piece to Make Sure It’s Closed (a horror game about closing a garage door) as it’s a great example of how you can make an effective horror game from a mundane everyday object like a light switch.